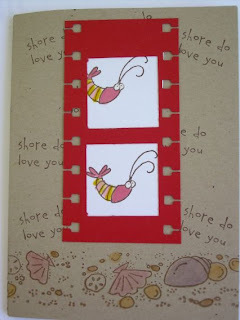 Crab and Company is a darn cute stamp set found on page 63. 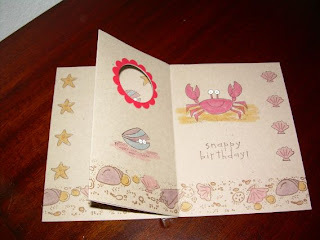 The 14 piece set gives you endless possibilities for cards and also has a coordinating wheel featuring shells. The shown card is great use of several stamps from the set. I got the idea of the card lay-out from another SU demonstrator, Dawn. She used, Unforgettable, an 11 piece set found on page 61 along with two great wheels that coordinate with the set. http://www.dawnsstampingthoughts.typepad.com/dawns_stamping_thoughts/2007/05/cruise_card_tut.html. I've included the link to this cute file in the middle card. 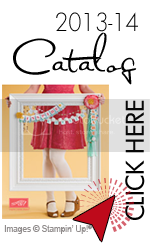 Sale A Bration is almost over. There are ten days left to choose a free stamp set for every 50.00 merchandise purchase. Don't miss this once a year event.